Gahwa', a strong cardamom coffee concoction is common among Arabs. Used commonly as flavoring agent in baked goods etc. In Europe and North America, used in curry powder and sausages. Used in perfumery and ayurvedic medicines. 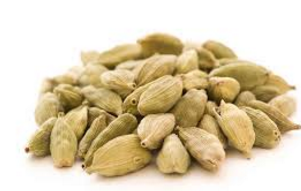 Cardamom has many medicinal values like it Controls heart rate, production of red blood cells and blood pressure. What is Cardamom (Elaichi) Called in Hindi and Other Indian Languages (Regional)? Cardamom is commonly known as Choti Elaichi in Hindi, in Tamil it's called Elakkai, in Malayalam it's called Elakkaya / Elakka, in Telugu it is called Yalakulu / Elaichi / Yaalakkaya / Yealak-Kayulu, it is known as Yalakki / Yelachi in Kannada, In Bengali they call it Elach / Garate, in Gujarati it is known as Elcho / Elaychi.